A short trip to London was planned around visiting MisterAirmiles and his wife, Christmas shopping and a cocktail party for enthusiastic Head for Points readers. This cost 16,000 avios and £70 for 2 RFS return tickets from Inverness. This was the first time I had used the BA flight from Inverness to Heathrow since it started in the Spring of 2016. Usually the flights are pretty expensive compared to the numerous easyJet options to either Luton or Gatwick but on this occasion the timings and availability at short notice made BA the preferred option. We left home in brilliant sunshine, blue sky and deep frost, to be confronted by thick fog in the Moray Firth, only a few miles away: This did not bode well. Needless to say, the inbound flight was diverted to Aberdeen, and we were informed, pretty promptly, that we would be bussed to catch the return flight which was waiting for us. Our flight should have departed at 1215. We were on the road ‪at 1300. Only several miles from Inverness airport, and before we even reached Nairn, the weather was back to bright sunshine. A smooth trip through, by D&E Coaches, had us in the Aberdeen Dyce terminal at 1500. Great! Plane waiting and into London by 1730…or so we thought. A lady inside informed us that the Inverness A319 had already left at 1400 and we all had to re-book onto one of 3 Aberdeen to Heathrow flights leaving later on. You can imagine the disgruntlement! The lady said Inverness staff should have re-booked us. Well, who knows, but obviously communication issues between ground staff! So we joined the long queue; I did ask about a priority queue ,as it is a benefit of being a BA Silver member, to be told that there wasn’t but we might get pulled out! I wasn’t holding my breath! However, there appeared to be another queue which was moving faster with only a few folk in it. So, being not someone to follow the crowd, Mrs Pushy here joined it, leaving Daddyairmiles in the long queue just in case I was sent packing! Hey Presto! No problems and We soon had seats on the first available fight at 16.30. Off to lounge for a very late snack and some calming wine. Priority boarding into row 28 – the last row on the plane! I have never sat so far back! Is this snobbery at work? Perhaps, but seatguru always tells me that the last row is near the toilets and galley and the seats don’t recline very much. However, we were just glad to be on the plane and get to London in a fairly reasonable time, even if it meant I had to forego a shopping trip in Knightsbridge! 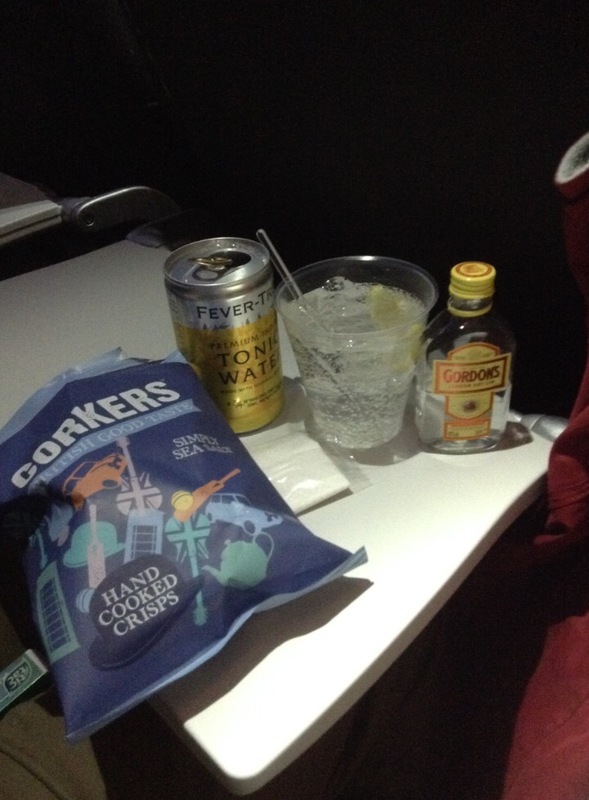 It was a very noisy take off – really noisy – but we were soon airborne where we made the most of our last opportunity to enjoy the complimentary G&T on board before BA make you pay for it. Disgraceful, BA! Alex Cruz should be shown the door for his ruination of our national carrier! So, uneventful and pleasant flight. Landed 18.05 hrs and met by Misterairmles, which was a treat as the Piccadilly line was disrupted and I wasn’t paying HEx prices.